Janowski’s Wagner cycle arrives at Lohengrin and by this point in the series some things can safely be relied on. The first is Janowski’s penchant for fast tempi which, in this context, carries the welcome advantage that each act fits onto one disc. It seldom feels rushed, however. When he broadens out it is for the more famously contemplative moments, such as In fernem Land or Einsam in truben tagen. In fact, the dawn interlude in the third act begins remarkably slowly but gathers pace as it develops, an effect that not everyone will enjoy. The other normally dependable advantages are slightly less reliable this time around. One is the beauty of the orchestral playing, which is still extraordinary. However, it takes a while for the shimmer effect to set in. The divided strings of the prelude are ever so slightly shaky in the opening bars and I couldn’t really relax into it until the entry of the woodwinds. The scenes surrounding Lohengrin’s entrance in Act 1, however, are wonderful, as is the playing around In fernem Land. The string tone for the opening of Act 2 is wonderfully dark. The other advantage is the quality of the recorded sound. It’s very good, bringing clarity and light to the string and wind sound especially. However, the brass feel slightly recessed this time around: the important trumpet fanfares at the climax of the prelude are difficult to hear, and most of the big climaxes are a little underplayed, including the prelude to Act 3. It’s most damaging in the final bars of the second act where the theme of the forbidden question should thunder out on the brass but here struggles to make itself heard above the general orchestral texture which can come across as slightly thick and muddy. Perhaps I’m only noticing these flaws because these aspects have been so excellent in other instalments of the series, but it’s a pity that the magic is less forthcoming this time around. Still, get over this and there’s a lot to enjoy. Most discussion will probably centre around Klaus Florian Vogt’s assumption of the title role. I’d heard the name before but I’d never heard him sing until I put on this recording. At first hearing I found the voice very difficult to place. Initially it is very light, almost childish in places, and it almost entirely lacks the burnished quality that so distinguishes, say, Domingo’s reading of the role. There are times when he can even sound a little pinched and he is certainly a far cry from the traditional heldentenor sound of, say, Siegfried Jerusalem or James King. However, the more I heard of him the more I liked him. The finest quality he brings is one of vulnerability, something that is undoubtedly an important part of the character’s make-up, particularly in Act 3, but something we so rarely hear. In Vogt’s hands the character appears sympathetic and genuinely interesting. We actually feel for him when he is summoned back to the realm of the grail at the end. His voice has a wounded, pleading quality to it in his interactions with Elsa, both in the third act and, perhaps even more convincingly, the closing scene of Act 2. Vogt’s reading may be a little unconventional, but he brings something new and valuable to the role and for that reason alone he demands to be heard. Like Vogt, Annette Dasch does not have a voice one might normally associate with her role. She is a touch mature and even a little effortful in her first appearance, but she grows in stature as the opera develops and she makes an urgent foil for Vogt. Their duet at the start of Act 3 is very compelling, perhaps the highlight of the set. A genuine conversation seems to be taking place between them and there’s heightened sense of tragedy when she eventually asks him his name. Gerd Grochowski is a vital, wide-eyed Telramund who refuses to accept his own defeat and has a convincing, dark urgency which suits the role well. Susanne Resmark does not sound happy in the role of Ortrud, however. Her voice appears big and unwieldy and she squawks a little when going for some of the higher writing. More damagingly, she lacks the subtlety that the role really requires: this Ortrud is blankly malevolent and little else. Günther Groissböck is a vigorous King Heinrich, sounding younger than you might expect for the character, but he is grips the attention and adds an extra sense of energy to the part. Markus Brück’s herald is dependable, as are the cameo roles. The choral singing is also first rate, and here again the quality of the recording comes into its own, with lots of transparency revealing inner lines and balancing the voices well against the orchestral background. Somewhat like his Meistersinger, this is a good addition to Janowski’s Wagner cycle, but despite its evident attractions it falls short of being essential. Lohengrin is, after all, probably the best represented of all Wagner’s operas on disc, and each set - including this one, to be fair - has something special to set it apart. Domingo’s singing is exceptionally beautiful and well rounded, both for Solti on CD or Abbado on DVD. Siegfried Jerusalem for Abbado on CD gives perhaps the best overall interpretation of the title role. He is backed up by a sensitive Cheryl Studer as Elsa and an extraordinary Orturd from Waltraud Meier. James King and Gundula Janowitz are the sweetest sounding pair on disc - if slightly anonymous at times - for Kubelik. Barenboim’s men are outstanding while his women are a little bland, and Kempe’s extraordinary Vienna performance still holds its own decades after it first appeared. 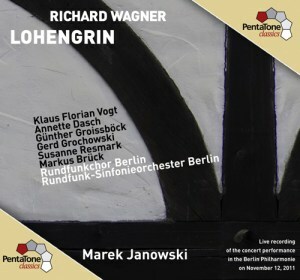 When you compare this Pentatone release to these, or even to other modern DVD releases, most notably Kaufmann and Harteros in Munich or Nagano’s Lyon production (also featuring Vogt in the title role), Janowski is solid but not superb.